The house is normally rented for 12 people. 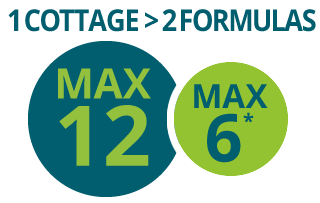 However, in the preceding three weeks, you can rent the cottage for “Max 6” : 3 bedrooms (sleeps 6) for 2/3 of the normal rental price. 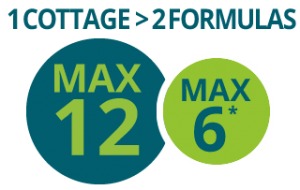 The formula “Max 6” is open at any time for midweek (except Christmas en New Year). Booking with “Max 6″ is made only by mail (contact). Please find attached, the inventory of the lodging and the internal rules. Click here to book or for further information. Bedsheets, duvet covers and bathtowels are not provided. Bedsheets required, even if you bring sleeping bags! Wastewater from our house are processed by a natural lagoon in the garden. We invite you to discover the biological and ecological products. Consider: dishwashing liquid, dishwasher tablets, toilet paper (non-chlorinated or recycled), soap, shower gel and shampoo. You do not know how you can get? Contact us, or here’s a helpful link.